Here’s a couple of trivia questions about the NFL’s left-handed quarterbacks. Let’s see how well you know your southpaw signal-callers in the history of the NFL. Which left-handed QB has started the most games in the NFL? Which left-handed QB has the highest Passer Rating in the league’s history? Which left-handed QB has the most wins as a starting QB in the NFL? Fourteen different left-handed quarterbacks have thrown for 10 or more touchdowns in their NFL career. 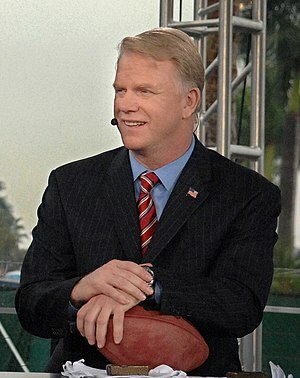 Leading the pack is CBS’ The NFL Today commentator Boomer Esiason, who tossed 247 TD passes in his 14-year NFL career that included stops in New York with the Jets and in Arizona, on top of his 10 years in Cincinnati. Here’s the list of left-handed quarterbacks who have 10 or more career TD passes. Seven different left-handed QBs were first round selections in the NFL Draft. They were: Michael Vick, Steve Young, Matt Leinart, Frankie Albert, Cade McNown, Todd Marinovich and Tim Tebow. All total, 27 left-handed quarterbacks have thrown for a TD in the league’s history. Steve Young holds the mark for most TD passes by a left-handed QB in a season with 36 in 1998. Esiason has started the most games with 173. Young has the highest Passer Rating with a career mark of 96.8. Stabler has the most wins with 96. In addition: Young has the highest career pass completions rate for a lefty with 64.3 percent; Esiason has the most passing yards with 37,920; Stabler has the most career interceptions for a lefty with 222.